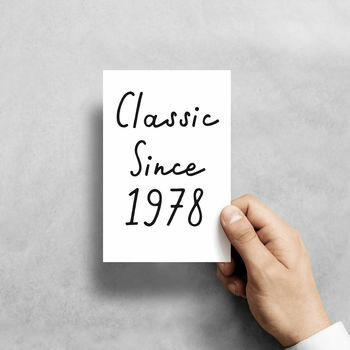 Remind the birthday boy or girl that their age makes them a true classic with this cheeky card that's sure to raise a smile. Don't settle for a bland high street card on their special birthday - choose a custom card for that personal touch. Option to send card direct : You can send this card direct to the recipient by selecting the options on the customise button. This is a great option if you are in a hurry or want to save on postage. Cards chosen with this option will have your message typed inside and sent in the envelope directly to the delivery address you have provided at checkout. Printed on 300gsm matt card. Supplied with a GOLD envelope and packed in clear cellophane.